Alfred Purton, the son of John and Clara Purton, was born at Barton St Mary in 1881. While he was still at school, Alfred’s family moved to Granville Street, Tuffley, where his father initially worked as a dock labourer but by 1901 both Alfred and his father worked together as Deal Porters and whereas Alfred subsequently became a Sawyer, his father was promoted to a managerial role as a Trade Deal Porter Foreman. During this period Alfred, a second row/backrow forward, joined the Gloucester Rugby Club and between 1899 and 1908 made 138 appearances for the club, of which ninety-six were for the First XV. During his career he scored eight tries for the First XV and five for Gloucester A. 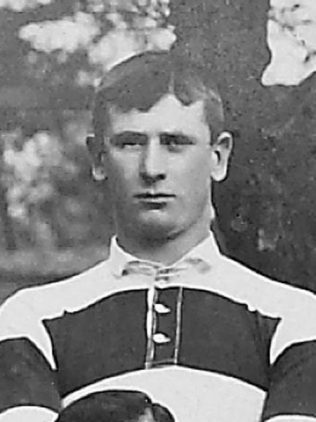 In the 1902-03 season he was appointed as captain of Gloucester A and the Citizen subsequently reported that the “…Club are fortunate in securing such a promising player to lead the second string. Purton knows his work and, if properly supported should prove a success in the position….” However his skills were in demand that season and, as a consequence, he played in twenty-nine matches for the First XV and in only three for Gloucester A. Alfred’s strengths lay in broken play and he frequently distinguished himself with “…splendid work in the open.” His contribution to the Club was recognised by his inclusion in the Club’s Honours Boards for the 1901-02, 1902-03, 1903-04 and 1906-07 seasons. Besides rugby, Alfred enjoyed other local sporting success, mainly as a boxer, and this continued into his army career, enjoying victories in the Brigade of Guards competitions whilst in training at Caterham. Alfred was called up to fight in the Great War in 1916 and joined the 4th Battalion, Grenadier Guards as private (27506) although not before he married his fiancée, Florence Louise Bick. He landed in France on Easter Monday, 9 April 1917 and shortly thereafter took part in one of the major battles of the Great War, the Third Battle of Ypres (31 July – 10 November 1917), more popularly known as ‘Passchendaele’. The offensive was planned as a series of distinct battles, the first of which was the Battle of Pilckem Ridge with the 4th Battalion, Grenadier Guards on the extreme left of the British attack which had the objective of capturing the ridge which, although only seventy feet above the surrounding countryside, in the flat lands of the Ypres Salient provided ‘commanding’ views of the area. Expecting a long drawn out affair, the men were ordered to carry one iron ration, one lemon and two water bottles, one of tea, the other of rum, in addition to the usual requirements of extra ammunition, hand grenades, flares and entrenching tools. At 3.50 am on 31 July 1917 the British barrage opened along the whole front and at 4.28 am as the barrage moved forward the attacking troops climbed out of the relative safety of their trenches and crossed No Man’s Land only to be met with a German retaliatory barrage which had started the instant that the British barrage had lifted. The German machine gunners began to sweep No Man’s Land and during this period Alfred Purton received gunshot wounds to his head and one of his legs. After immediate emergency treatment just behind the lines he was transported to the Base Hospital at Boulogne to stabilise his wounds prior to transfer to the UK for further treatment and subsequent convalescence. By mid-August his wife, Florence, was granted permission to travel to France to visit him in hospital in Boulogne and she spent some time there with him. However Alfred Purton never went home and died shortly after Florence had returned to Tuffley Avenue in Gloucester. Alfred died on 27 August 1917, from wounds received in battle, and was buried in the Boulogne Eastern Cemetery in grave VIII.I.18. He is commemorated on the Roll of Honour in the Lion’s Den, the Kingsholm Stadium War Memorial and the Gloucester War Memorial. He was also included in the Roll of Honour published at the Guards Memorial Service at St Paul’s Cathedral on Wednesday 5 February 1919.